Given the Thanksgiving holiday here in the United States and all that comes with it, in the near future many of you are likely to be launching a copy of iMovie to piece together movies of family and friends. For this reason, we'll skip many of the finer points in our "Getting Started With iMovie 10" series and move directly to creating a straightforward iMovie project. You're familiar with iMovie's interface, and you know how to import media. Now it's a matter of placing the media you want in the timeline, adding transitions and titles, and exporting the resulting movie to a form that other people can view. Speaking broadly, iMovie 10 allows you to create two kinds of projects: a movie or a trailer. We want to create a movie. To do that, choose File > New Movie or press Command-N. You'll see a Create window that contains iMovie's themes. I'll discuss using themes in a later lesson. For the time being, just choose No Theme, click the Create button at the bottom of the window, and then name your movie in the sheet that appears. Leaving still images aside for now, let's look at adding video clips to your movie's timeline. Select an event in the Libraries pane, and any clips that belong to that event appear in the Browser pane to the right. You have many ways of adding clips. To add an entire clip, click the clip and press the keyboard's X key. Click the Plus (+) button that appears when you hover your cursor over the clip, and it joins the timeline below. Alternatively, you can press the E key to add the selected clip. Or, if you like doing things the old-fashioned way, you can drag the selected clip into the timeline. If instead you simply click in a clip and then add it, by default the four seconds following the selection will be added to the timeline. To add a specific portion of a clip, click and drag over the part of the clip that you'd like to add, and then press the E key, click the Plus button, or drag the clip to the timeline. Continue dragging in video clips as the mood strikes. As I've alluded, you can also add still clips. You can do so most easily by selecting iPhoto Library from the Libraries pane and then, from the pop-up menu that appears in the Browser pane's top-left corner, choose an image classification--Events, Faces, Places, Albums, Facebook, Flickr, or Smart Albums. Dig down to the image you want and drag it into the timeline. You don't have to let iMovie apply Ken Burns to all of your still images. To change how it treats stills, click in the Viewer pane and choose Window > Movie Properties (Command-J). Click the Settings button at the top-right of this pane, and then click the Photo Placement pop-up menu to the left. You'll find that you can choose Fit or Crop in addition to Ken Burns. In later lessons I'll go into greater detail about editing. The following tips are for the "just give me the basics" crowd. Rearranging clips: To shift a clip or image to a new location, click and drag it to where you want it. Shorten or lengthen clips: When you first make a selection in the Browser pane, the selection might not be as precise as you want it. You can easily fix that. Just click on either edge of your clip and drag it toward the clip's middle to shorten it, or away from the middle to lengthen it. In a case where you've pulled a portion of a longer clip from the Browser pane, you can extend it to as much as the full length of the original clip. (If you've imported the full clip already, of course you can't increase its length.) You can make still images as long or as short as you like by dragging their edges. Shorten or lengthen audio: Suppose you have a clip in the timeline that contains audio. Further suppose that you'd like that clip's audio to continue past the length of the edited clip--you want it to underlie the beginning of the next clip, for example. You can arrange this by detaching the audio track from the video. To do so, choose Modify > Detach Audio (Command-Option-B). Similarly, when you detach audio from video, you have the option to edit either but not both of the clips, cutting out, say, an awkward burp in the audio track. To add transitions to your movie, select Transitions under the Content Library heading (or press Command-1). The Browser pane now displays all of iMovie's built-in transitions. Select the one you want and drag it to the beginning or end of a clip. By default, inserted transitions last half a second, but you can change that length by selecting the transition and then entering a new length in the field to the right of the Transitions pop-up menu in the Viewer's top-left corner. As I hinted earlier, there are tasteful transitions and those that are less so. Generally, fades and dissolves look the most polished. When you apply the kinds of transitions last professionally used in 1970's television programming, however, you're setting yourself up for a video that looks distinctly amateurish. A title at the beginning of your movie can add yet another layer of polish. To do so, select Titles under the Content Library heading (or press Command-2). iMovie's titles will appear in the Browser pane. If you've applied a theme to your movie, titles appropriate for that theme show up in the titles area. Underneath you'll see iMovie's stock collection of titles. To add a title just drag it to where you wish to place it--at the beginning or end of your movie, for example. Select the title in the timeline, and you'll see placeholder text; just double-click that text to enter your title. To adjust the title's font, size, alignment, and formatting, click the Adjust button at the top of the iMovie window. Options for adjusting the title's characteristics will appear. You'll be amazed at how a five-minute video of little Buster and his pal Jeanie soaking each other in the kiddie pool becomes less tedious when it's accompanied by a toe-tapping musical track. To add one, choose iTunes under the Content Library heading (or press Command-4). As with transitions and titles, you'll see the contents of your iTunes library in the Browser pane. Drag a track that you'd like to use as background music into the music track that appears below iMovie's timeline (the one marked with musical notes). If you prefer to import an audio clip from somewhere other than your iTunes library, you can do that too. Just drag it from the Finder into this music track, and it will be added. Note that if you use someone else's music and upload it to a site such as YouTube or Vimeo, you can expect a take-down notice sooner rather than later. You've added your clips and stills, tweaked their length, placed tasteful transitions between them, tossed in a title or two, and wrapped everything up in a musical package. It's time to share your movie. The means for doing so is the Share menu at the top of the iMovie window. Click it to reveal your choices: Theater, Email, iTunes, YouTube, Facebook, Vimeo, CNN iReport, and File. Here's a brief rundown on each. Theater: A feature new to iMovie 10, Theater is where you view your finished movies, trailers, and clips. By default, when you share a movie via Theater, it automatically uploads to iCloud. (You can switch off this option in iMovie's preferences.) Once uploaded to iCloud, it is then viewable on devices associated with your iCloud account--an iOS device, an Apple TV, or another Mac, for example. To view a movie within Theater, just click its Play button. The movie will fill your Mac's screen. Email: You can send a version of your movie via email. When you select this option, an Email window appears in which you can edit the movie's description and tags. You can also choose a size--Small, Medium, or Large--from a pop-up menu. Beneath the preview of your movie (which, by the way, you scan scrub through by dragging your cursor across it), you'll see its length and estimated size. 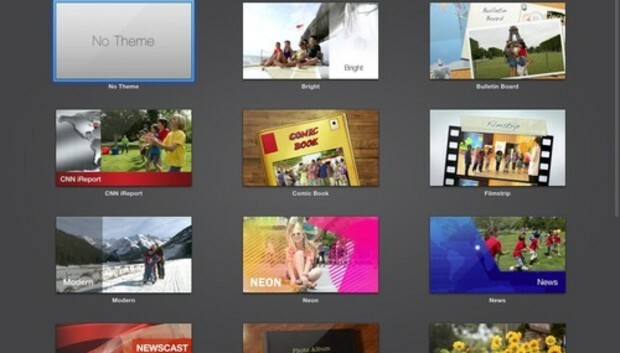 Once you've done all of that and clicked Share, iMovie will create the movie. At the top of the iMovie window, you'll see a progress indicator showing that iMovie is indeed encoding your work. When it completes the job, your default email client will open and display a new email message that has your movie appended to it. Just fill in the To field, enter any other text you like, and send it. iTunes: You can also share your movie directly to your iTunes library. Click iTunes to bring up a window similar to the Email window I just described. Again, you can change the contents of the Description and Tags fields. You can also choose a size for your movie: SD, Large, HD 720p, or, if the source material supports it, HD 1080p. Again, you see its length and size beneath the preview. You additionally see a Compatibility entry. Click it, and a menu appears that tells you which devices will play your movie--for example, all iPads and your Apple TV, but not an original iPod. When you click Share, the movie is encoded and then added to your iTunes library as a home video. YouTube, Facebook, Vimeo, and CNN iReport: I decided to gang together these services because they work in a similar way. To upload your work, you must have an account from the service you choose. Once you've obtained that account from the service's site, select it from the Share menu and in the resulting window click the Sign In button. You'll be asked for your username or email address and password. Each service allows you to choose who can see your uploaded video--just you and your friends but not the public at large, for example. In other regards it works much like the share options I've already discussed. You can choose a size and edit the Description and Tags fields as well as see the movie's length and estimated size. File: And finally, if you simply wish to export a QuickTime version of your movie--which you can keep on your computer or add to an iDVD project--you choose the File option. You'll recognize the options in the resulting window, including editable Description and Tags fields, a Size pop-up menu, and information about length, size, and compatibility. Click Next, and you can choose where on your Mac to save the encoded movie. Note that with this option you don't have the ability to tweak QuickTime settings as you did in the previous version of iMovie. You can't, for instance, choose a particular encoder or change stereo audio to mono. Instead, iMovie 10 exports your movie as an MPEG-4 file using the H.264 encoder. If you want greater control over QuickTime sharing, you're better off using the previous version of iMovie or trading up to Final Cut Pro X. And that's it, the quick-and-dirty means for making videos with iMovie 10.